Majesty 2 released on Friday, September 18th, a game I've been ridiculously excited about. It's as much a re-imagining of Majesty as it is a sequel, as it's been so long since the original came out. 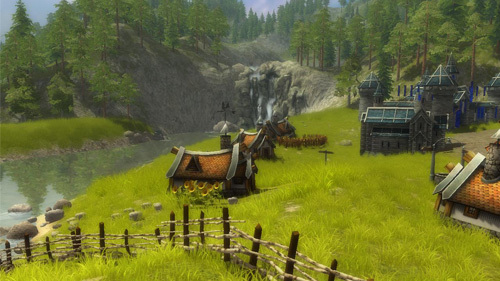 If you never played Majesty, it's an odd combination of SimCity + World of Warcraft + The Sims. Weird, yeah. But it was fun and it worked. You basically built the buildings of your empire, had a simple tech tree and recruited heroes. You had no direct control over heroes. Each class had a unique AI and would pursue its own goals. But, you could encourage heroes to do what you wanted by placing reward flags around the map with money attached to them. Later in a game, you could directly influence the world through a variety of spells to aid your heroes (healing, buff and attack spells). Majesty's multiplayer had a fair number of options, including PvP and co-op. The co-op wasn't really compstomping that you would find in an RTS, it was more like an RTS version of Horde mode. Players would have to survive in a map for a set time, or until they had wiped out all monsters and/or lairs, or achieved some other victory condition. Even 9 years later, it's still fun. 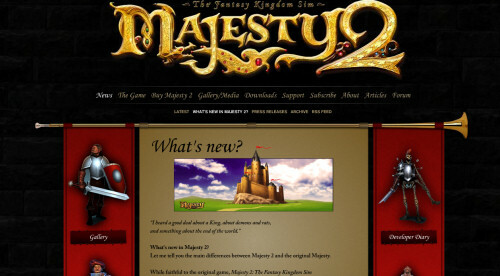 Throughout the development of Majesty 2, the official message had been that co-op would be in the game and that multiplayer would be an awful lot like Majesty. This type of language was still on the official site right up until the day before the game was released. In Majesty 2 our goal is to perfect different kinds multiplayer modes, like player vs. player as well as cooperative play. The Levelmaker (the person who creates the multiplayer map where the game is set) can enable either competitive or cooperative play during a mission. Then, players can choose which side to support. On maps which enable cooperative play, players can either play together against computer-controlled opponents, or in union vs. union – 2 players against 2 players. Majesty 2 is designed from the ground up with multiplayer gameplay in mind. We as developers do our best to offer players a wide range of competitive strategies towards development and victory, and to make multiplayer fast-paced and enjoyable. The behavior of the heroes was also designed with an eye towards multiplayer and battles between players themselves. Game development is a long, complex process, we all know that. But promising options throughout development, and then not communicating their loss until after shipping the game is just unacceptable. It's been awhile since I was really angry that I had wasted my money on a game, but that's how I felt last night. Thankfully the publishers are active on the forums and communicating with the fan base now about these issues. Everyone's hoping for a patch down the road to get at least some of the old options back into this game. But it's a shame we have to wait and hope, rather than just play the game we all loved so much.